New chamber for M4 series. Quality chamber is an important for a stable and good performance of an AEG. Only metal machined chambers provide the highest precision and the best sealing. 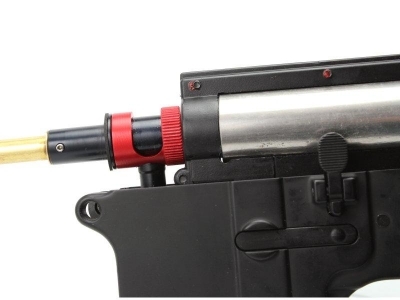 It is required to loosen a barrel with the delta ring. Insert chamber and then fasten barrel and delta ring back. Delta ring key is included in the product packing. This assembly method proof perfect chamber fit without a wooble and space. HopUp is adjusted by the red metal ring. 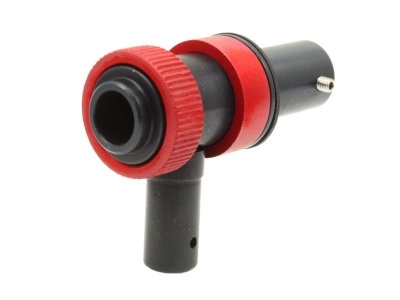 It can rotate almost 360 degrees and pressure regulation is thus very smooth and responsive. The package include quality HopUp rubber AimTop 50°. But of course the user can use the original or any other AEG HopUp buckings and achieve even better performance. Two screws for the inner barrel fasten. Rubber pad for shock absorption. Chamber was tested on M4/M16 series: Dboys, APS, CYMA, G & P etc.